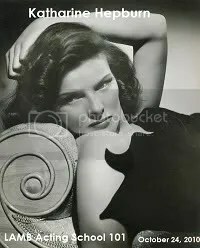 Jane Hudson (Katharine Hepburn, not to be confused with Bette Davis) is a middle-aged, unmarried secretary from Akron, Ohio. After spending a few years saving up the money, she finally fulfills her lifelong dream of vacationing in Venice. Even though she makes friends on the trip over and at the hotel, she quickly becomes lonely when she feels like the only single person amid an ocean of couples. While sitting at a cafe alone, she realizes a man is staring at her, which makes her uncomfortable and she leaves. 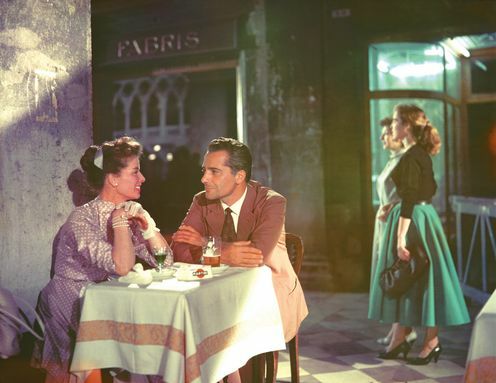 The next day, Jane goes shopping and finds herself in a store owned by Renato (Rossano Brazzi), the man who was staring at her in the cafe. He sells her a red glass goblet that he swears is antique and offers to try to find her a matching goblet. Later, he goes to her hotel to ask her to dinner. Jane is initially reluctant, but Renato convinces her to take a chance on him. While they’re talking, another couple at the hotel comes in with half a dozen brand new goblets that look identical to the one Renato sold Jane and swore was antique. Of course, Jane is mad, but Renato eases her worries and the two of them have a lovely evening together. The next day, Jane spends the day getting all dolled up for her date with Renato that night. While Jane waits for Renato at the cafe, Renato’s assistant comes to tell her Renato is running late, but accidentally admits that Renato is married and has children. Absolutely horrified, Jane leaves and returns to the hotel. Renato finds her and explains that he and his wife are separated, he just didn’t tell her because he didn’t want that to deter her. He manages to convince Jane to stop merely longing for something and to actually experience it. The two of them go on to have a wonderful and happy time together, leaving Jane to decide between staying in Venice with Renato or returning to Akron, Ohio. I know some people who aren’t big Hepburn fans because they think her performances can be over the top, but that is definitely not the case here. I think this is one of her most restrained performances. Plus she also had some great co-stars. I enjoyed seeing Katharine with Gaetano Autiero as the kid who befriends Jane. Rossano Brazzi was wonderful as well. I loved how he played Renato very ambiguously and makes it tough to figure out exactly what his intentions are. David Lean did a stellar job directing. Every single shot in the movie looks like it could be a postcard. It’s no wonder there was an increase in tourism in Venice after Summertime was released! I know it made me want to take a trip to Italy. Another great thing about this movie is that it’s all about an older woman who fulfills a lifelong dream and finds romance in the process. Hollywood has never been the kindest place for women over forty and Katharine was 48 years old when she made this. Summertime is the kind of movie Meryl Streep has been fighting to get Hollywood to make more of. But you just know that if they tried to make Summertime today, Jane would be played by someone in her thirties or they’d just throw some glasses and a ponytail on a twenty-something to make her look plain. Excellent work on this review. Like you, Jane Hudson is one of my favourite incarnations of our Lady Kate. The film itself is one of my favourites from Lean, and considering the masterpieces he;s given us that says a lot. Kate just works brilliantly in the role making us love Jane and that ending…so beautiful. Thank you! I love that ending, too! Beautiful is the right word for it. That’s the kind of ending so many movies want to have, but most of the time, they don’t seem to be able to get it just right.